Facebook CEO Mark Zuckerberg just posted a message on the company blog confirming the number of users for the social networking service that’s been floating around for some time now. The blog post, titled ‘200 Million Strong’, says the milestone will effectively be achieved today (no more speculation needed, more than the entire population of Luxembourg). Zuckerberg goes on with the usual talk about how the service does its part to help change the world by making information sharing easier etc., but it gets interesting again when he embeds a video of a heat map that shows Facebook’s growth since 2004, depicting how quickly people across the world are connecting on the network. Unfortunately, it can only be viewed and shared on Facebook, but here’s a direct link to the video. Facebook’s growth keeps on amazing. 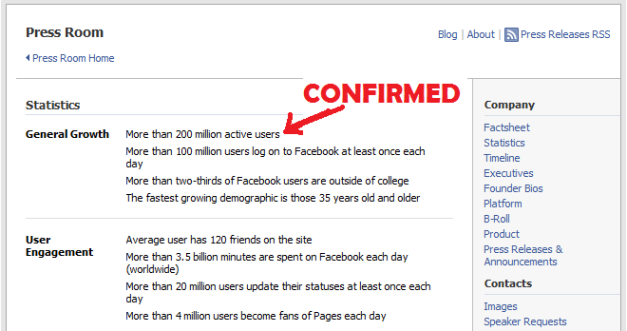 In January this year, the official number of users was still 150 million, and grew to 175 million in February. That means that a stunning 50 million people signed up for the social network in 2009 alone to date (or 500,000 per day, more than the entire population of Luxembourg). At the end of last month, we reported that its traffic is going through the roof too, according to recent worldwide comScore data. 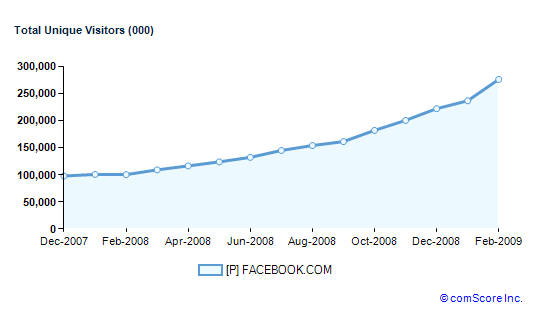 The data also showed that more than 1 in 4 people with Internet access visited Facebook in February 2009, translated to 276 million monthly unique visitors (or more than twice the size of MySpace’s traffic globally). 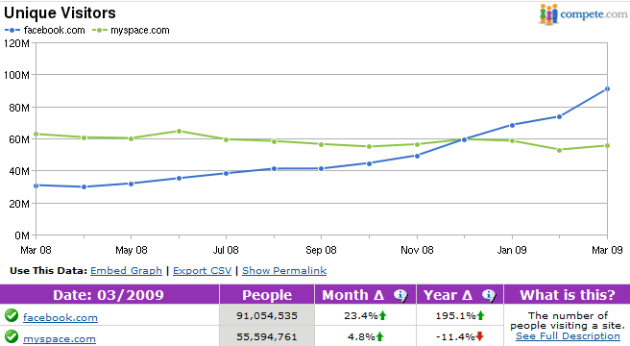 As usual, Compete’s traffic data paint a picture of lower visitor numbers for both companies but reports a similar trend.